There are a few reasons I busted low with this one First off...moisture had no problem overcoming dry air at onset. The low levels quickly saturated allowing the first flakes to make it to the ground on the earlier side of my predicted onset times. Second...the best lift axis had a hard time advancing north. People up in the western half of Pennsylvania are probably wondering where there snow is at. Northern progress from the initial overrunning precipitation just kinda stopped and allowed snow to keep falling and falling heavily over the same areas. The third and final reason was how slow cold air (at the surface and aloft) was to erode. Part of this goes back to the stubbornness of everything (including warm air) to lift north. Another factor was the strength of the in-situ wedge. We didn't have high pressure in a great place for the classic wedge but steady precipitation falling into what was left of the recent arctic air mass allowed cold to become "stuck". Left over snow pack certainly aided the process. Overall...certainly a tricky storm. 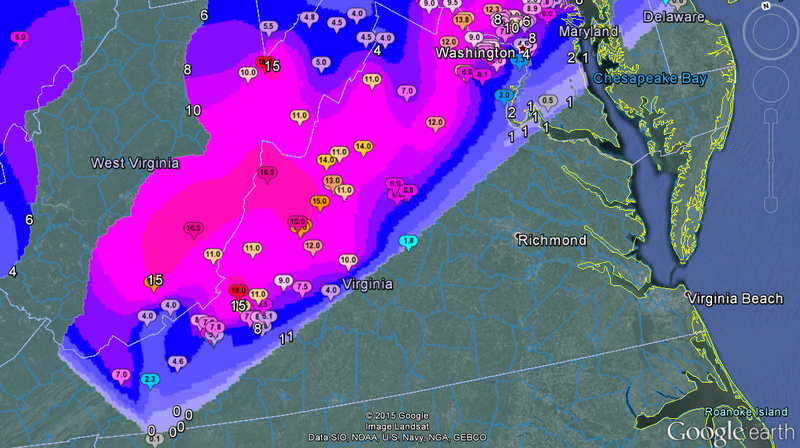 4" (north) to as much as 16" (south) amounts across the Shenandoah Valley with even higher reports in the mountains. Temperatures in the upper 30s and low 40s will help the clean up process today but we'll likely have refreeze problems overnight into the day tomorrow. After these back to back decent snow events, I hope no one ever tries to cancel winter again in January.